And we wonder why there’s such a wide variety of small theropods in the Morrison. The real news is that at least two snakes were in the same fossil bed. They hunted in packs! Whoa, I just heard about this on the radio minutes ago and it’s already here on SV-POW, complete with photoshopped, re-dated Hollywood poster! I gotta hand it to you Matt, I’ve seen fast before, but you’ve got super-human speed. The very fact that snakes were found preserved in the act of eating baby sauropods is a one-in-a-million occurrence in itself. I wonder how many “zillions” of defenseless babies there really were. Literally tons upon tons of the little critters. I think it’s just a matter of time before someone discovers a sauropod nesting ground big enough to make Horner’s “egg mountain” look like a speed-bump. Is there any hint of what species the sauropod babies might be? Props to Mike for tracking down that Stout restoration, I thought of it instantly when I read the press release but I couldn’t recall the source. I’m going to pull down that book off the shelf and revel in the glory of emaciated pterosaurs. Though, minor quibble, Stout really only anticipated the discovery by a few years, the specimen was originally collected in 1984! HILARIOUS fake poster. Well done! I just want to say that that fake movie poster is hilarious. As both a dinosaur nut and an avid snake lover, I must say that this an absolutely AWESOME discovery! Seriously. Totally. Just… Wow. Bizarreness! I had not heard of the psittacosaurovore Repenomamus before, either. 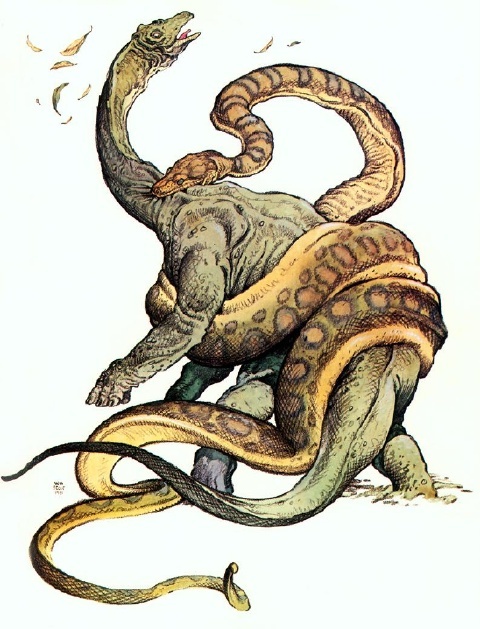 Stout’s picture, wild and admirable, seems to me though to warp feasible perspective just a tad, where the snake crosses from outside left thigh to inside of left foreleg. That is an incredibly cool discovery! A pretty big snake, too – 3.5 meters. I’ve seen this said a lot, but it never seemed all that solid; the size gap between sauropods (barring Amphicoelias- or Puertasaurus-size mega-titans) and theropods isn’t any bigger than between wolves and moose, say. I’m not all that knowledgeable on this issue, though; does anyone know if there is any particular evidence that sauropods 10x more massive than the local predators were any more safe from predation than mammals 10x more massive than the local predators? I certainly doubt that all the sauropods that show evidence of being gnawed on by allosaurs were just scavenged after dying of natural causes. “A swamp full of radioactive awesome” – that’s just what I’ve been saying since hearing rumours of this specimen a few years back. Multiple snake-egg associations and a well-preserved skull are icing on the swamp. 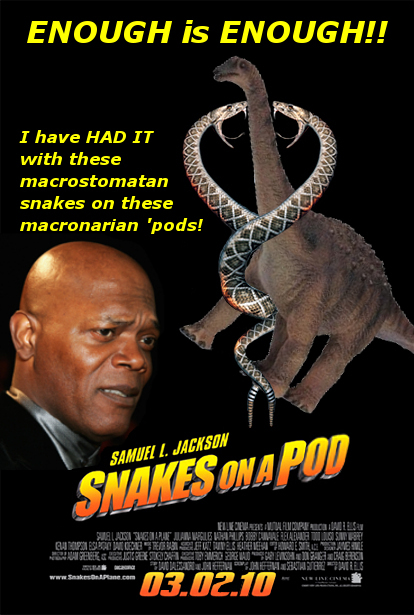 But a big part of the awesome is that they’re NOT ‘macrostomatan’ snakes. Not only do madtsoiids fall outside ‘Macrostomata’ in analyses based on morphology, but when you do the DNA it turns out there’s no such clade anyway. _Sanajeh_ swallowed sauropods with jaws that a python or boa would just laugh at. 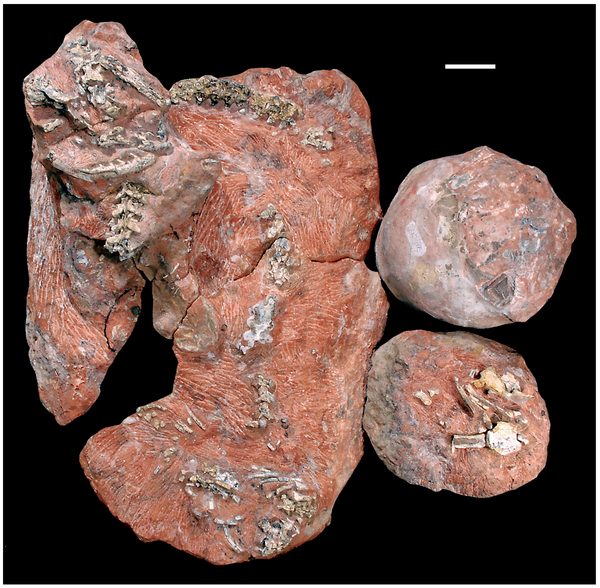 Especially since in the Gobi, fossils of “nests” of oviraptorids include the remains of smaller nonoviraptorosaurs, such as troodont skulls, mammals, etc. Prey, and potentially cannibalism, was not selective to a particular diet, so the hypothesis goes.